At Lake Wenatchee where the Weekend Hideout home is located, almost any recreational activity you wish to enjoy is within reach. The cross-country skiing trails are within walking distance from the home. 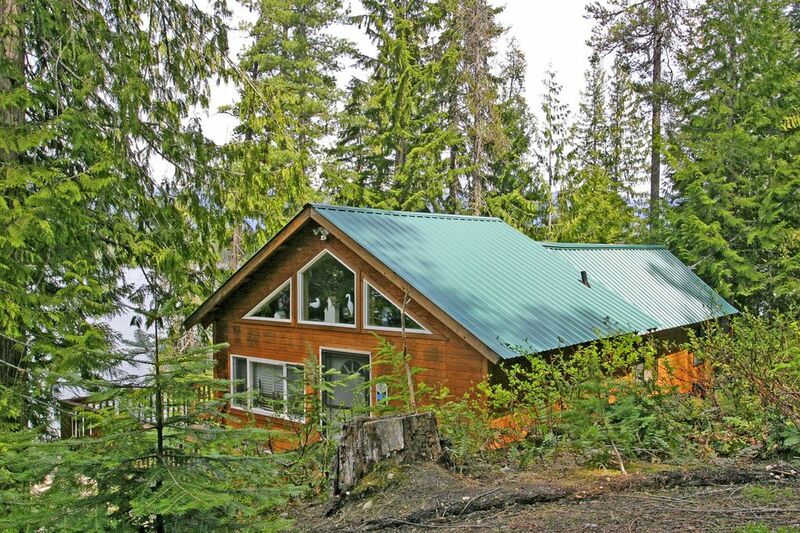 This recently remodeled cabin features a large private sandy beach on the south shore of the beautiful Lake Wenatchee. There is a spectacular view of the lake on both the upper and lower decks. The cabin offers a full kitchen, spacious enough for cooking up hideout snacks and meals! While you enjoy your good eats, you'll be able to look out the windows onto the lake. Bring up to 8 of your loved ones, family or friends! Bring whoever you want to spend the weekend hiding out with. The upper deck wraps round much of the cabin, and best of all, the lower deck is just 25 steps to the waters edge! If you just need a day in, to relax and unwind that’s no problem either. Kick back and watch a movie, or curl up in front of the fire with a good book. Either way this is the place to get away from it all, hide out and relax. Looking to enjoy a getaway in the Leavenworth area? You've come to the right place because our Lake Wenatchee properties are only a short 30-35 minute drive to downtown Leavenworth itself. The Lake Wenatchee area has endless recreational activity options throughout all four seasons. If you decide to stay with us, you'll have the opportunity to explore and adventure around the lake and throughout the towering timbers. During the Summer, there are bird watching, fishing, boating & rafting and trail hiking opportunities. The warm weather brings wild life all out so take the opportunity to explore the area. The colder months of Winter allow for skiing, snow shoeing, as well as ice fishing & skating adventures. No matter what time of the year you decide to visit, the scenic views are to die for. As we stated earlier, you're also a short drive away to downtown Leavenworth where the Bavarian culture and spirits exist. You can enjoy a variety of events throughout the year such as Oktoberfest, the flowering Maifest or the Christmas lighting and caroling during December.